Very cute sitting panther cub made of cast ceramic. 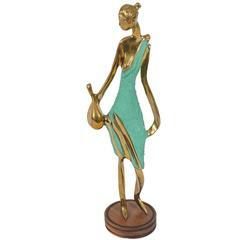 Statuette of an elegantly dressed lady made of brass on a wooden base. Ronzan Italian ceramic “African Gazelles”, 1950. An unsual 20th century curiosity of a scientific example of a baby in the womb hung on a curved metal frame into a wooden base. Midcentury panther sculpture is designed in bronze and decorated with black enamel. It is very solid and heavy. Particular Mid-Century Modern ceramic statue made in Italy signed on the bottom Gianni Ronzan, a famous manufacturer.